Fan Pu did not have an art education. When she was put to work within the framework of the Cultural Revolution near the border of the country in 1956 – a time she does not judge entirely negatively – she familiarized herself with the life of simple people and their habit of giving each other self-made gifts. Paper cuttings are among these. These are figures cut out with a knife and decorated with several colours. Fan Pu mastered this technique not only in order to make small presents, but also to propagate her faith. She became one of the best known Christian artists of the new China. She never denied her Chinese heritage, but deliberately retained the centuries-old Chinese ethical consciousness rooted in Confucianist wisdom. She hopes that this important legacy will also keep its validity in the new state-capitalistic China. She has made a whole series about the sayings of Confucius to emphasize that it makes sense to honour this tradition and follow it as an important ethical guide. There is no contradiction with Christian ethics here for her. Fan Pu is fully devoted to the gospel of Jesus. Her art can be subdivided in two categories: biblical illustrations and thematic representations. Illustrations of the Bible, especially of the life of Christ and the apostles, however, are for her always interpretations as well as images, saying more than explicit words alone. Fan Pu likes to add words, so that those who know nothing of the church can also understand her paper cuttings. With the thematic images she wants to make people think. The work, Faith and Theology, depicted above belongs to this category. Hands abound. Hands of children, hands of men and women, workmen and scholars, all together form the robe of Christ. These are our hands reaching for Jesus. Fan Pu wants to incite and encourage us to touch Jesus, if only the seam of his garment. Just like the Syrian-Phoenician woman, who only touched the robe of Jesus and was healed (Matthew 9:20 ff.). We will be healed in the same way, even if we ‘understand’ little of Jesus. There is, however, another dimension to this paper cutting, one that goes back to a story stemming from Buddhist literature. This is the parable of blind people, who touch an elephant and all think that the part of the elephant they felt is the whole elephant. They start to fight with each other about how the elephant looks, as each one of them has formed their own ‘understanding’ of the animal. But the king (=Buddha) laughs mockingly as they are blind and all fail to grasp the complete ‘truth’ of the elephant. Fan Pu does not apply the parable to the various religions (as is so often wrongly done in school books), but to the different Christian denominations that each have their own scholars and members. She respects that each church acknowledges and is dedicated to Christ in its own way. Nobody, however, has knowledge of the whole Christ. We know only as much of him as we can ‘understand’ on the basis of what we perceive and experience of him. We must respect each other’s limited knowledge and not make it the subject of battles as scholars so often do. In the Fan Pu’s paper cutting all are seated around a table together. Christ is in their midst. They should not occupy themselves with fruitless Christological discussions, but rather be glad that Christ is in their midst and offers each one as much knowledge of himself as they can comprehend. Then the table of contention will become a table of Holy Communion, with Jesus as its host as he offers himself to us. The blue colour of the figures from various cultures and backgrounds portrays the hope that the theologians will understand that theology should serve faith in Christ. Theology should clarify the gospel and not stir up fights that lead to discord. Fan Pu is an artist who is dedicated to faith in a land that does not know complete freedom of religion yet. For this reason she wants to serve the church with her art. A genuine artist can become a genuine preacher! 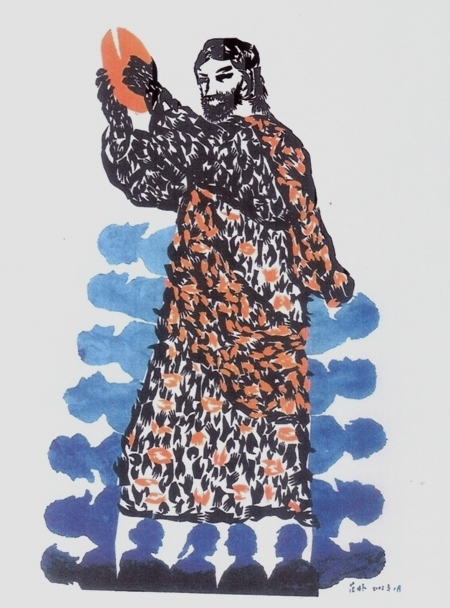 Fan Pu: Faith and Theology, 2002, paper cutting, 100 x 78 cm. From: Fan Pu, The Way of my heart. The Paper Cuts of Fan Pu, Beijing 2010, p. 255. Theo Sundermeier (b. 1935) lived in Africa for many years and is Professor Emeritus of the Theological Faculty of the University of Heidelberg. Apart from his work in the area of religious studies and missiology, he has written extensively about hermeneutics and about Christian art in Germany, Africa and Asia. His books about Christian art (all in German, see the titles below) are about Johannes Schreiter, the Totentanz (Dance of death), Christian themes in Indian art, Christian art in Japan and Korea, and an introduction to Christian art worldwide. - Aufbruch zum Glauben. Die Botschaft der Glasfenster von Johannes Schreiter, Frankfurt 2005. - Totentänze – Tanz des Lebens (with Jürgen Moltmann), Frankfurt 2006. - Christliche Kunst – weltweit. Eine Einführung, Frankfurt 2007. - Christliche Themen in der indischen Kunst: Von der Mogulzeit bis heute by Gudrun Löwner, Martin Ott and Theo Sundermeier, Perfect Paperback 2009. - Christliche Kunst in Japan und Korea, Frankfurt 2010.